All of our tank door gaskets and inflatable seals are made in the USA by employees in the USA with ingredients from the USA. 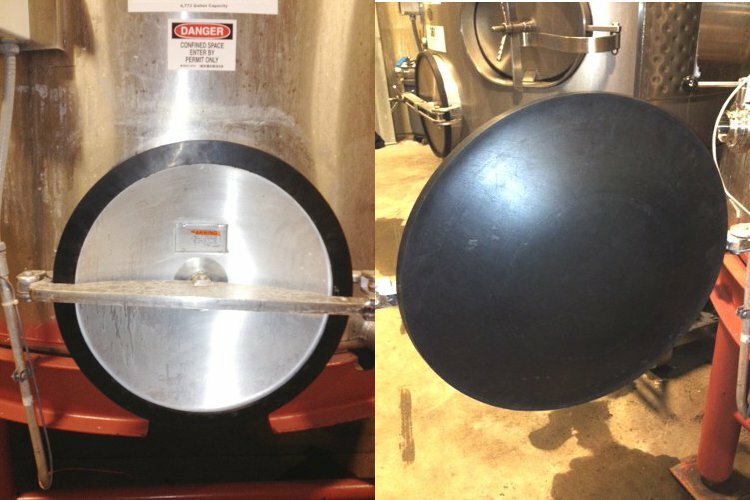 Our quality winery and brewery tank door gaskets come in over 140 different styles in various sizes and hardness. They can fit either belly-in or belly-out doors, ovals or circles. We also make cut to length gaskets with over 25 different cross sections. These gaskets are extruded to the length desired and then hot vulcanized together. The hot vulcanizing creates a solid gasket that has better wear and tear resistance versus gluing the ends together. Our gaskets can be made to accommodate a 6" full face to 6 foot diameter and up. A partial cross reference guide can be found here.